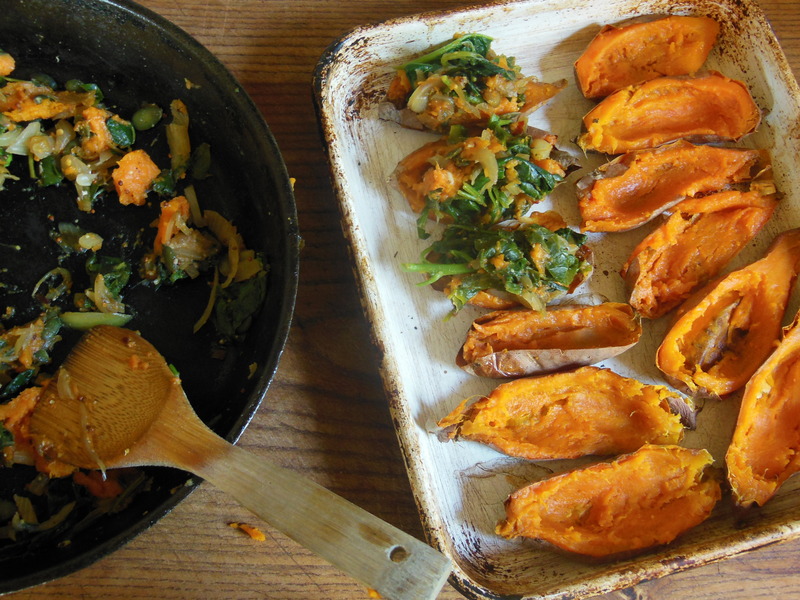 Sweet potato is full of goodness and much better for you than a standard potato. The stuffing is delicious and can be modified with any veggies you have in your fridge. Preheat oven to 180C, place sweet potato on a tray and bake for around 1 hour until soft. While they are baking, dice onions, zucchini, almonds and sun dried tomatoes, in a large heavy bottomed pan, sauté the veggies in water, adding extra water as it evaporates. Chop time and add to pan along with spinach and tamari. Cook until onions are soft. Remove kumara from oven and allow to cool slightly then cut them in half and scoop out flesh, leaving a little against the skin for structural support. Add kumara flesh to onion mixture and stir through. Stuff mixture back into sweet potato and sprinkle the top with nutritional yeast. Bake for 30 min until hot. Serve with avocado and pesto. Oh I just discovered sweet potatoes. This looks fab. I will give a try. Thanks for sharing.